institutionalized leadership, which occurred in the subsequent transmission of a threefold ministry of bishops, priests, and deacons? Did that historical development betray Jesus' original dream of a community of male and female disciples as co-partners variously empowered by the Holy Spirit to minister to the whole community? In its normative, first-century period was the Church directly governed by the Holy Spirit and did it flourish without supervisory authorities or any official establishment? Or was there always some kind of leadership which rightly developed and was handed on to successive generations for the good of all? We can put the issue in terms of the thesis proposed by Willi Marxsen, Siegfried Schulz, and some other twentieth-century scholars: 'early Catholicism', a deterioration they already detect in Acts, the Pastoral Letters, and other NT writings. This thesis claims that the good news proclaimed by Jesus and Paul suffered inasmuch as a structured institution emerged to dispense salvation through ministerial ordination, a hierarchical succession of leaders, set forms of doctrine, and a re-established law.5 Without thinking their way through any such sophisticated thesis as 'early Catholicism', some instinctively presuppose that the earlier situation must, for that very reason alone, be the more authentic. Some (or even many?) continue to subscribe, unthinkingly, to the old myth of an original purity, corrupted by a subsequent history of decline. The 'real' or the 'true' is found only at the start. On our guard against such a myth, what can we discern about the situation of Jesus and the post-resurrection developments? See J. D. G. Dunn, Unity and Diversity in the New Testament (London: SCM Press, 2nd edn. 1990), 341—66; G. O'Collins and D. Kendall, The Bible for Theology (Mahwah, NJ: Paulist Press, 1997), 101-16. Although some NT scholars dispute the existence of such a collection of sayings behind the Gospels of Matthew and Luke, Q still seems to most scholars the best working hypothesis about the immediate origin of sayings that are common to these two Gospels. See F. Neirynck, 'Synoptic Problem', in R. E. Brown et al. , New Jerome Biblical Commentary (Englewood Cliffs, NJ: Prentice-Hall, 1990), 587-95.
reflects the existence of this core group (Matt. 19: 28 = Luke 22: 30). They are 'in place' to receive a foundational appearance of the risen Christ, a fact first attested by a traditional formula cited by Paul (1 Cor. 15: 5) and subsequently narrated in varying ways by the Easter chapters of the Gospels. The Twelve are given by Christ authority to lead and teach in his name, an authoritative role for which, as Luke and (in his own way) John indicate, they are empowered by the Holy Spirit. Their apostolic mission shares in and comes from the mission of the Son and the Holy Spirit. See E. Nardoni, 'Charism in the Early Church since Rudolph Sohm: An Ecumenical Challenge', Theological Studies , 53 (1992), 646—62. the 'evangelists' or official messengers/preachers of the good news (see Rom. 10: 8—17). The foundation of many local churches by apostles and others brought a shift in leadership, when settled pastors (called 'overseers', 'elders', and 'deacons') took over from the missionary apostles, the other evangelists, and the founders among whom had been the 'pillars' of Galatians 2: 9. A range of NT sources reflect this movement from missionary preachers to settled, pastoral leaders (Acts 20: 17, 28; Phil. 1: 1; 1 Pet. 5: 1—4; the Pastoral Letters to Timothy and Titus), even if many details about the appointment of the latter, their leadership functions, and their relationship to the travelling missionaries remain obscure. The Pastoral Letters, when recording a more developed organization of ministries, speak of 'overseers' or 'bishops' and their qualifications (1 Tim. 3: 1-7; see Titus 1: 7-9), of the 'elders' or 'presbyters' to be appointed by Titus 'in every town' (Titus 1: 5-6; see 1 Tim. 5: 17-20), and of the qualities appropriate for 'deacons' (1 Tim. 3: 8-10, 12-13), and apparently also for deaconesses (1 Tim. 3: 11).8 There is some indication about succession in teaching authority (2 Tim. 2: 2). Much is stated about the teaching, preaching, defence of sound doctrine, administration, and domestic behaviour expected from leaders. But apart from some passing regulations concerning worship (1 Tim. 2: 1-2, 8) and several references to the 'laying on of hands' (1 Tim. 5: 22; see 1 Tim. 4: 14; 2 Tim. 1: 6), nothing further is said about the liturgical life of the community and, for instance, about the roles taken by these leaders (or others) in baptizing and celebrating the Eucharist. 8 Acts reports 'elders' alongside 'the apostles' in Jerusalem (Acts 11: 30; 15: 2, 4, 6, 22—3; 16: 4). When Paul visits Jerusalem for the last time, no 'apostles' are mentioned but only 'all the elders' alongside James (Acts 21: 18). Acts 6: 1—6 reports the appointment of seven men to 'serve' (diakonein ) in the administration of the Jerusalem community. One of them (Stephen), however, works wonders and proves an outstanding speaker (Acts 6: 8—10) before being put on trial and martyred. Another (Philip) becomes a wandering preacher and miracle-worker (Acts 8: 4—40). suspicion, play down the role of the Holy Spirit in guiding the foundational period of the Church, and deny the authority of some, especially the later, books of the NT. A sharp, anti-Gnostic observation of St Irenaeus (c.130—c.200) may apply here: 'When the heretics are refuted from the scriptures, they turn to accusing the scriptures themselves, as if there was something amiss with them' (Adversus Haereses, 3.2). Irenaeus encouraged allegiance to the normative voice of the scriptures when facing the question of the Church's structure and other such critical issues. We return to him shortly. The last paragraph may have put matters too sharply. But we meet here what we might call a 'Protestant' and 'Catholic' parting of the ways. A 'Protestant' reading can dismiss the later NT books as representing a regrettable decline into 'Early Catholicism' and appeal to the earliest forms of Christian community, to the extent that they can be identified and recovered. A 'Catholic' reading is comfortable with the patterns of organization emerging in the later NT writings and flowing into the post-NT developments. 9 See E. Duffy, 'Was there a Bishop of Rome in the First Century? ', New Blackfriars , 80 (1999), 301—8. Whatever we conclude about Rome, Ignatius of Antioch states firmly that one cannot speak of a 'church' unless it has a bishop , presbyters, and deacons (Epistle to the Trallians , 3. 1). On the development of the episcopacy in the early Church, see F. A. Sullivan, From Apostles to Bishops (Mahwah, NJ: Paulist Press, 2001); on Rome, see P. Lampe, Die stadtrömische Christen in den ersten beiden Jahrhunderten (Tübingen: Mohr-Siebeck, 1987). In Ch. 3 we will return to the issue of scripture and tradition, which was central in Irenaeus' polemic against the Gnostics. His understanding of the Holy Spirit was not yet sufficiently elaborated to appreciate clearly the Holy Spirit as the primary bearer of the Church's tradition and life. His principle, 'where the Church is, there is the Spirit of God' (ibid. 3. 24. 1), formed a sound starting-point but needed considerable filling out. AD there were probably less than 10,000 Christians, who made up around fifty communities—from Spain (perhaps), southern France (perhaps), Italy, Greece, Asia Minor, North Africa, Egypt, the Middle East, and beyond in Iran and India. Besides the work of such itinerants as Prisca and Aquila, Christian leaders met the challenge of maintaining contact and unity in basic beliefs and practice by a steady exchange of letters. Paul had left an extraordinary example, with letters that strikingly exceeded in length what was customary in the ancient world. Even his shortest letter, that to Philemon (only 25 verses), went beyond the average letter composed by Greek- and Latin-speaking writers of his time. As well as the Pauline correspondence, the NT contains seven letters attributed to others, one of which, First Peter, was sent from Rome to the Christians dispersed here and there in Asia Minor or what is now Turkey. The author of the Book of Revelation sent his work from the island of Patmos to seven Christian communities, also found in what is now Turkey (Rev. 1: 9). A few years later, on his way to be martyred in Rome, Ignatius, the bishop of Antioch in what was then the Roman province of Syria, wrote seven letters: six to particular Christian communities and one to Polycarp, bishop of Smyrna, who was himself to be burned alive about AD 156. Recalling Peter and Paul, the two great leaders martyred in Rome some forty years earlier, Ignatius pleaded with the Roman Christians not to hinder his martyrdom: 'Suffer me to become the food of wild beasts; through them I can reach God. I am God's wheat, and I am to be ground by the teeth of wild beasts that I may become the pure bread of Christ' (Epistle to the Romans, 4. 1). Persecution and martyrdom, particularly that of leaders, began very early in the history of Christianity. In AD 44 James the son of Zebedee suffered martyrdom by being beheaded by Herod Agrippa I. Paul lists the imprisonments, floggings, and other sufferings he had already undergone by the late 50s (2 Cor. 11: 23—7). Before his Damascus Road encounter with the risen Christ, he himself had acquiesced in the stoning of Stephen (Acts 7: 55—8: 1). In AD 62 the Jerusalem community lost its leader when St James was stoned to death. In his Annals (15. 44) the Roman historian Tacitus tells the gruesome story of Christians killed as scapegoats by the Emperor Nero in AD 64. Right from the first centuries various authentic records of martyrdoms have survived. The Passion of St Perpetua describes how she and other Christians in Carthage were mauled by wild beasts and then had their throats cut in AD 203, during a persecution under the Emperor Septimius Severus. When Church leaders met for the First Council of Nicaea in AD 325, not a few of them showed the marks of recent persecution on their bodies. The hands of Paul of Neocaesarea had been paralysed by hot irons. Hosius, the bishop of Cordoba (d. 360) who acted as Emperor Constantine's adviser at the Council, and St Eustathius (bishop of Antioch 324—30) had both suffered during the cruel persecution of Maximin Daza (d. 313). Two Egyptian bishops had each lost an eye. One of them, St Paphnutius (d. 360), had also been hamstrung. His scarred body evoked the veneration of the bishops and others present; Emperor Constantine showed respect by kissing his mutilated face. Catholic Christianity has regularly been marked by suffering and martyrdom. In fact, while the brutal persecution of Christians in the Roman Empire was haphazard and often limited to their leaders, it repeatedly proved to be much worse elsewhere and in later centuries. In 1597 twenty-seven Japanese Catholics were crucified at Nagasaki; in the following decades thousands of other Japanese and some foreigners suffered death for their faith. The eighteenth- and nineteenth-century persecution in Vietnam resulted in thousands of martyrs. On a visit to South Korea in 1984, Pope John Paul II canonized 103 Catholic Christians who died during persecutions in 1839—46 and 1866—7. From the end of the eighteenth century through to the middle of the nineteenth century, the Korean Catholic Church counted up to 10,000 martyrs, headed by St Andrew Kim Taegon. During the Ugandan persecution (1885—7) St Charles Lwanga and twenty-one companions were burned to death or killed by the sword. The king of Uganda executed numerous Anglican Christians as well as these Catholics. During the fourteenth century under Mongol rulers, especially Tamerlane (1336—1405), the Church of the East (often called the Nestorian Church) suffered a savage persecution. The tyranny of Joseph Stalin (1879—1953) brought death to numerous Orthodox Christians, both in the USSR and (immediately after the Second World War) in satellite Communist countries. Catholic Christians have certainly not been alone in dying for their faith, but they have done so in large numbers—not least in the twentieth century. Following this excursus on later martyrs, let us go back to the early Church and sketch something of the lives of Christians in the pre-Constantine period, and then outline the enduring contributions to Catholic Christianity that came from five outstanding figures: Justin, Irenaeus, Tertullian, Origen, and Cyprian. 10 See J. N. D. Kelly, Early Christian Creeds (London: Longman, 3rd edn. 1972); W Kinzig and M. Vinzent, 'The Origin of the Creed', Journal of Theological Studies , 50 (1999), 535-59. The celebration of the Eucharist on Sunday or the Lord's Day reaches back to the start of Christianity. Paul (1 Cor. 11: 23—6) and Luke (Acts 2: 42; 20: 7) witness to that. The Didache seems to refer to the eucharistic liturgy in a prayer: As this broken bread was scattered over the hills and then, when gathered, became one mass, so may your Church be gathered from the ends of the earth into your kingdom' (9. 4). A few years later St Justin Martyr (c.100—c.165) wrote a fairly detailed account of eucharistic worship on Sundays (First Apology, 65—7). (Here he also indicated the practice of collecting money for the relief of widows, orphans, prisoners, the sick, and others in need. Of this more anon.) The Apostolic Tradition of Hippolytus, from the beginning of the third century, includes a eucharistic prayer, which (with slight adaptations and the addition of the 'Holy, Holy, Holy' or 'Sanctus') became after the Second Vatican Council (1962—5) the second eucharistic prayer for Catholics of the Latin or Western rite. 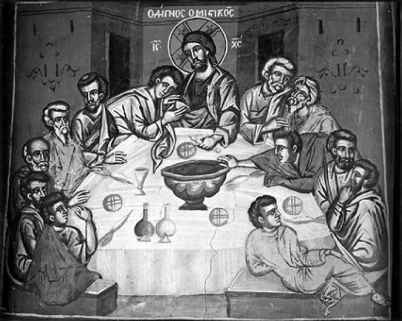 Then, as now, the Eucharist comprises two parts: the Liturgy of the Word, which followed the pattern of Jewish synagogue services, and the Liturgy of the Eucharist, which centred on Jesus' words of institution at the Last Supper and included an invocation of the Holy Spirit (the 'Epiclesis'). The first Christians held services in private homes or house churches. The oldest Christian building known to be used exclusively for religious functions seems to be a house remodelled extensively for such purposes around AD 235 in Dura Europos, an ancient city on the right bank of the Euphrates, north-west of Baghdad. When public freedom arrived with the Emperor Constantine, Christians built their own churches or restructured former pagan temples for their worship. Christian art then developed more freely. It had begun in the catacombs of Rome, with representations of Christ as the Good Shepherd, of the Last Supper, of the Virgin Mary, and of the Magi on their way to find Jesus. 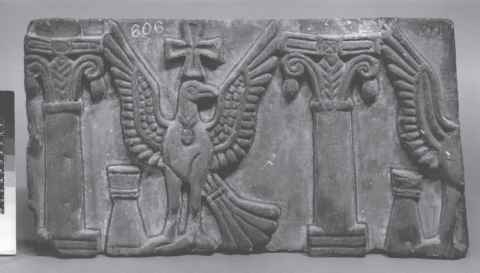 That earliest Christian iconography included no scenes of the birth of Jesus or his crucifixion. It took hundreds of years before artists directly expressed his crucifixion with all its pain, and his resurrection into glory. 11 On the role of women in the growth of Christianity, see M. T. Malone, Women and Christianity (Dublin: Columba Press, 2000); Stark, Rise of Christianity , 95-128. 12 H. Thurston and D. Attwater (eds. ), Butler's Lives of the Saints , iii (London: Burns & Oates, 1956), 2978; slightly edited. Who wrote "men and women who marry should enter the union with the consent of the bishop"?